You can fix your team! Working in a dysfunctional team is frustrating and stressful. No one wants to show up every day to a team that is constantly distracted by in-fighting, dragging each other down, disrupting one another’s performance, performing poorly, engaging in unethical behaviour. If this sounds familiar to you, you are not alone! From decades of experience in helping employers to identify and address team dysfunction, we know that managers and supervisors are often frustrated by a lack of time, experience, resources or good advice on how to deal with these problems. Meanwhile employees working in the team feel powerless and fearful of the consequences to their job security if they speak up. That’s why we wrote our latest book, Fix Your Team, published by Wiley in August 2018. The guided approach we introduce in this book can be applied by anyone who is working in, managing or advising a dysfunctional team. Whether you are a team member, in a service function, a team manager or a more senior executive with a dysfunctional team in your portfolio, this book will help. 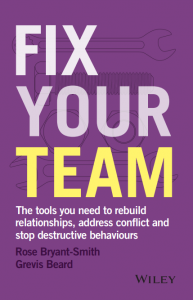 It will teach you how to identify dysfunction in your team, understand what is really going on, work out what to do about it and get everyone back to work. build the buy-in and respect of your team members.